After an absence of over 30 years, Olivier Award-nominated landmark musical Chess returns to the West End to play a limited 5-week season at the London Coliseum. 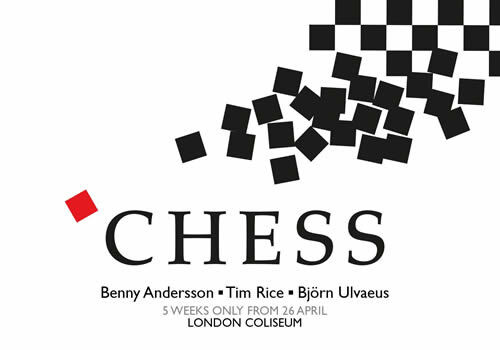 Written by legendary lyricist Tim Rice and ABBA’s Benny Andersson and Björn Ulvaeus, Chess is the iconic musical set against the backdrop of late 70s/early 80s Cold War. First seen on a London stage in 1986 at the Prince Edward Theatre, Chess was originally directed by Trevor Nunn, and featured a starry cast with Elaine Paige, Murray Head, Tommy Köberg and Denis Quilley. The production earned three Olivier Award nominations, including Best Musical, and later transferred to Broadway in 1988. Chess sees two grandmasters locked in a tournament of American-Soviet tensions and romantic rivalries. When two men step up to the board, one American and one Russian, they embark on a political struggle, until a Hungarian refugee enters the mix and sends the story into an emotional love triangle. As passions are heightened, politics become tenser, reaching an inevitable climax that threatens to destroy lives and loves. With a phenomenal score including show-stoppers such as “I Know Him So Well”, “One Night in Bangkok”, “Heaven Help My Heart” and “Pity the Child”, Chess is the acclaimed musical from Tim Rice (Jesus Christ Superstar, The Lion King, Evita) and ABBA songwriters Benny Andersson and Björn Ulvaeus. Cast members include West End veteran and theatre legend Michael Ball (Hairspray, Les Miserables) as Anatoly Sergievsky, Alexandra Burke (Sister Act) as Svetlana Sergievsky, Cassidy Janson (Beautiful) as Florence Vassy, Cedric Neal (Motown the Musical) as The Arbiter, Tim Howar as Freddie Trumper and Phillip Browne as Molokov. Directed by Laurence Connor (School of Rock, Miss Saigon), the revival features choreography by Stephen Mear (Gypsy, Top Hat) and is presented by Michael Linnit and Michael Grade in collaboration with the English National Opera. The musical will also feature the ENO Orchestra. Chess plays limited performances at the London Coliseum from May 1st to June 2nd 2018, with previews beginning April 26th 2018. Chess may not be suitable for children.